After and design cartoon has been finalized, a working pattern and ct pattern pieces are made. 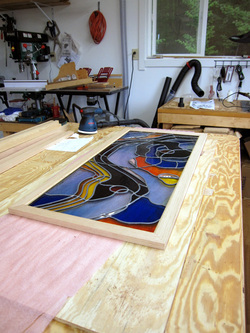 Wood blocking is prepared on two sides of the pattern to build the glass against. For this panel, brass framing is cut and installed on two sides. 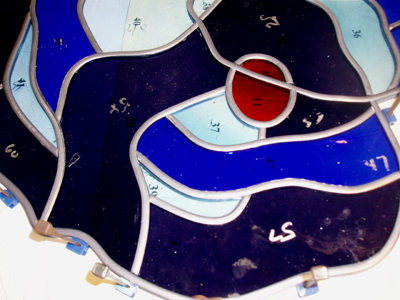 The glass is cut to the pattern pieces with space allowed for the lead cames. 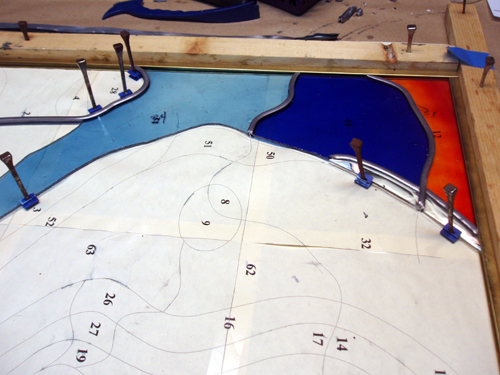 One at a time, the pieces are laid and fitted to the pattern and lead is fitted between the pieces. Piece by piece, the glass is carefully fitted to match the lines in the pattern exactly. Lead is cut and mitered to fit against each other tightly. Horse shoe nails are used to hold the glass and lead in place. 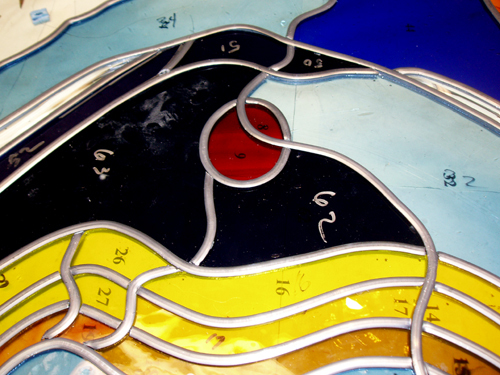 The Blenko glass is difficult to work . 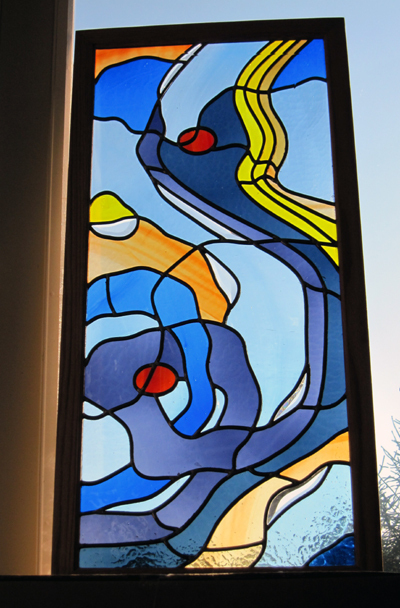 Because it is hand blown, the glass runs thick and thin. It is this very quality that makes it so beautiful. 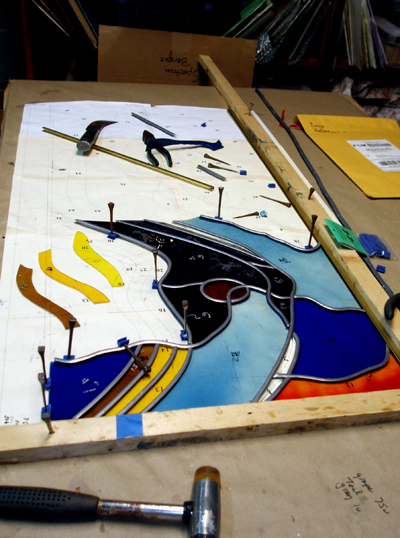 The design begins to appear as the glass and lead are slowly fitted to the pattern. 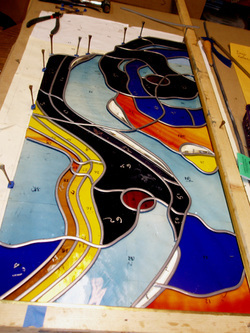 Leading is completed on one section of the panel. The lead joints will be soldered after all the pieces have been built up. Deciding the sequence of which pieces to lead can be tricky as the pieces must build outwards and some pieces are interwoven. Sections sometimes need to be leaded separately and then added to the larger pattern. The panel is almost leaded! 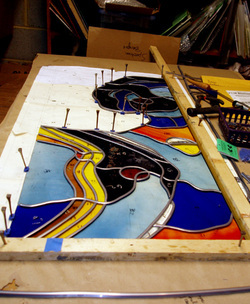 After the lead joints are soldered, the wood blocking is removed. A special cement is made to seal the glass and lead cames to protect from weather and add firmness to the panel. The cement putty is pushed into all of the cames, front and back. This is a very messy and smelly process. The cement will darken the lead. 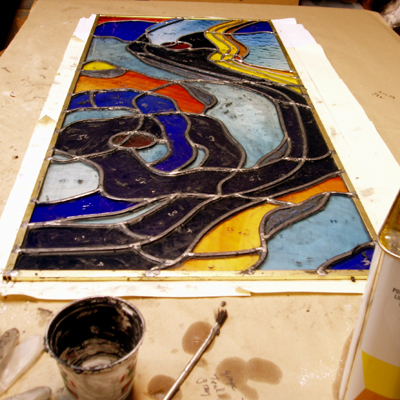 After the Cement has dried sufficiently and the panel has been cleaned, it is time to frame the panel. Oak has been routed to receive the brass edging and make a well-fitted and mitered frame. Screws and dowels join the miters. The wood is then finished with a clear oil finish. The finished panel is held up to the light to check for any flaws in the cleaning process and detailed. It is now ready to hang or install!